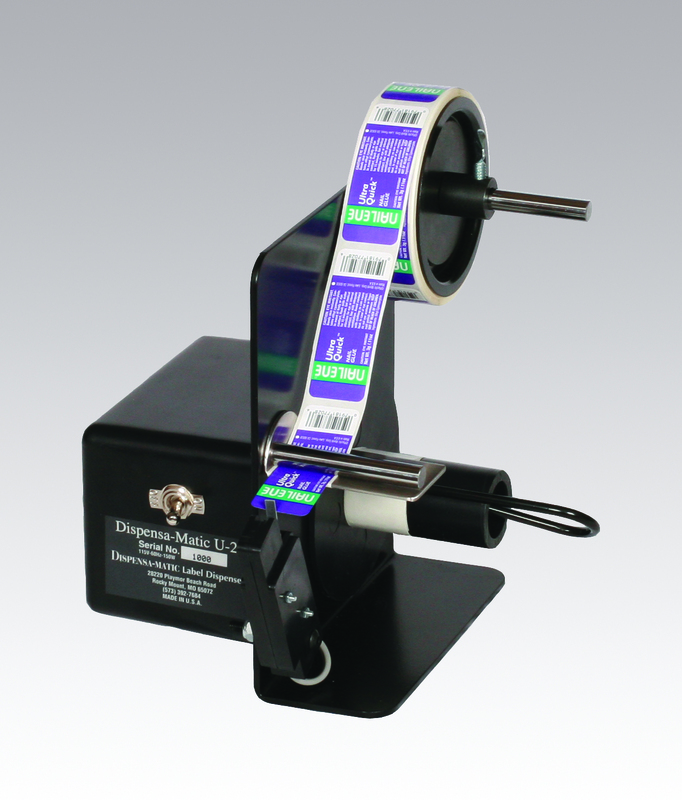 Dispensa-Matic U-25 Label Dispenser for labels to 2.5" widths. A one-time price of $495.00 will be added to your order. 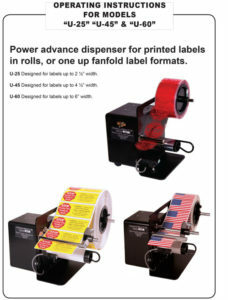 Dispensa-Matic U-25 Label Dispenser: Is a simple heavy-duty semi-automatic electric label dispenser that is designed for labels from 3/8 of an inch to 2.5 inch widths to any length tall. This label dispenser advances at over 4″ per second (Faster than so called High-Speed machines from competitors). U-25 allows you to peel small labels with ease. Dispensa-Matic Label Dispensers now have 2 options for sensing labels. The standard option is a photo detector that detects the label by “seeing” it from .5″ to 1.5″ away. This method works for most labels, even transparent ones. The other option is a brand new design, another Dispensa-Matic patented Original from Richard Shannon! It is an optical sensor with physical detector, allowing even the thinnest transparent labels to be sensed with ease. This sensor will operate with less than 2 grams of force (one fourth the force of the previous micro-switch), but tested to last for over 2 million labels! SATISFACTION GUARANTEED. If we cannot make you happy within 21 days, send it back. Limit 1 per customer. Full 3 Year warranty, including parts and labor. If repair is ever needed we offer a 1-Day turn-around! Dispensa-Matic U-25 is an original design: from Dispensa-Matic! American made precision, quality, support, and longevity with over 35 years of experience from the same owner/designer! Dimensions: 8″x8″x12″, Weight 7 Lbs.